JOHANNESBURG – MIGRANTS in South Africa have alleged double standards by the main opposition, Democratic Alliance (DA’s) threat to take Zimbabwe to International Criminal Court (ICC) and the United Nations Human Rights Council (UNHRC) after recent violent protests. grandstanding, particularly as the party continuously ignored incessant anti-migrant utterances by Johannesburg mayor, Herman Mashaba, who is a key member of the party. 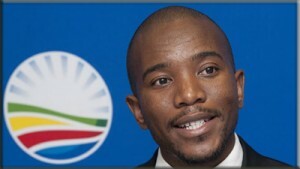 DA has remained mum on the alleged hate speech against foreign nationals. In an interview with CAJ News, Ngqabutho Nicholas Mabhena, Zimbabwe Communist Party (ZCP) secretary general, said Maimane should first condemn Mashaba than prioritizing Zimbabwe. “While it is within Maimane’s rights to go to Zimbabwe to meet with his political friends, he must also condemn the actions and utterances of Johannesburg Mayor (Mashaba) on xenophobia with the same energy he is raising on the Zimbabwean question,” Mabhena said. Zimbabwe. Secondly, no one from Zimbabwe would listen to DA because they represented apartheid regime,” Zunga argued. Recently, the opposition leader visited the Beitbridge Border where he claimed more than 130 000 Zimbabwean nationals fled the crackdown against protesters, to South Africa. “The most unfortunate part of Maimane’s visit to Zimbabwe would be viewed as grandstanding considering in previous xenophobic attacks against foreigners, not even a single official from DA ever condemned human life loss, including property and displacement of thousands of foreigners,” said Zveushe. Nkechi Okonkwo, a Nigeria national living in Rosettenville, Johannesburg, who was a victim of the 2016 xenophobic attacks, expressed doubt the international community, particularly the African Union (AU) and entire Southern African Development Community (SADC) would entertain requests by the DA. “The only opposition across borders that would draw African attention is the EFF (Economic Freedom Fighters) because what they stand for resonates well with majority blacks, which is economic freedom and equal opportunities to both blacks and whites,” Okonkwo said. The DA’s neutrality on Zimbabwe has also come under question owing to its bias in favour of the opposition Movement for Democratic Change (MDC) Alliance. Maimane is the acting chairman of Southern Africa Partnership Democratic Change.